Ever since Tom Taylor inspired quite a few of us to play with printers, I’ve been seeing what I can get mine to do. So far: barcodes were pretty quick. More recently, daily digests, twitter updates and even printing an entire a book. What’s next? Sparklines turned out to be fairly easy. I’ve written a basic Java library for talking to the printer, which I’ve shared on Github. The latest version of Microprinter.java connects over USB to the microprinter_sketch.pde Arduino sketch which then simply relays whatever you send to it on to the printer. Please feel free to adapt and improve. 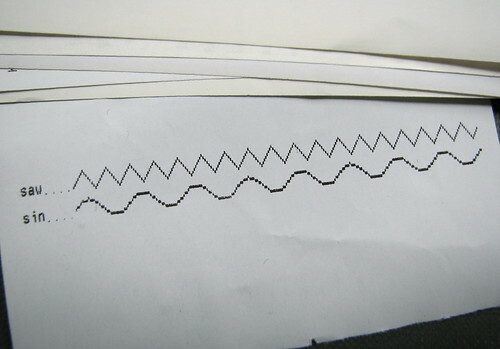 If you make any serious changes I'd love to see them, and don't forget to get involved on the microprinter wiki. I’ve been experimenting a bit more with the thermal receipt printer I bought recently. Inspired by Tom’s daily digests I’ve been trying some of my own. You only get 48 characters per line using the default font. 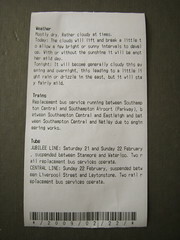 The alternative font (font B) is much denser, with 64 characters per line. 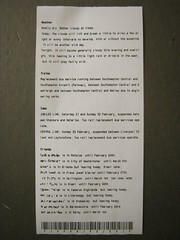 The second printout is only about an inch longer than the first one, yet has twelve additional lines of content. 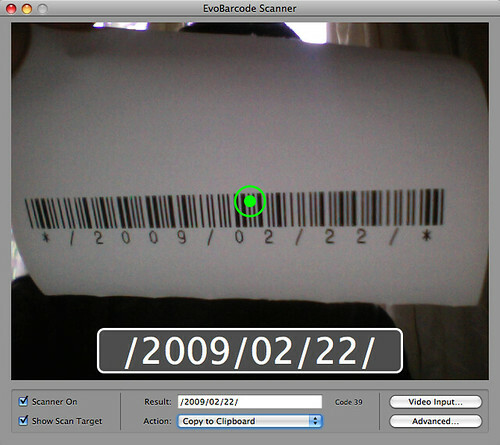 I used EvoBarcode Scanner to test reading it back in. Tonight I hooked it up to Twitter. Every minute to checks to see what my contacts are saying and prints whatever is new since it last checked (usually 2 or 3 updates). 30 minutes of my friends’ twitter updates equated to five feet of paper. I don’t think I’ll be running this all the time but it does feel reassuring to have it whirring away in the background. 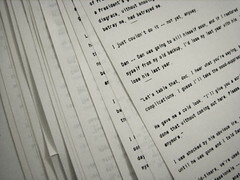 Another use of the Microprinter: printing books. 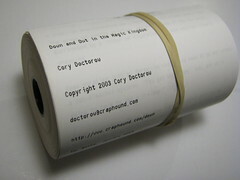 I took the text of Cory Doctorow’s Down and Out in the Magic Kingdom (mainly because I can). It has over 47,000 thousand words, and if you print it at 64 characters per line on standard 80mm thermal paper it’s about 60 feet long. Printing time: about 40 minutes (pausing briefly after every paragraph to let the printer catch up). Rolling it back up again took nearly as long. At Nick‘s very cunning suggestion there are perforations at every chapter (as well as every sub-chapter, which the ASCII text denotes using a ‘#’ character on its own). Together this divides the book into 59 perforated segments which are about 30cm long on average. Rather than needing a bookmark I’ll just tear off the sections as I finish them. It’s a portable, recyclable, tear-and-shareable book.